Detailed reporting gives you important insights that can help you improve, expand and optimize your education business. Opting for tutoring management software with built in reporting is a definite must. 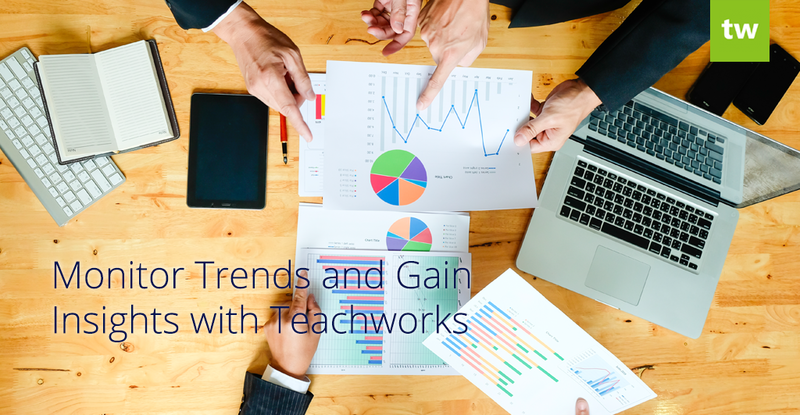 The Teachworks dashboard offers several reports that help you to stay on top of key performance indicators in your education business. 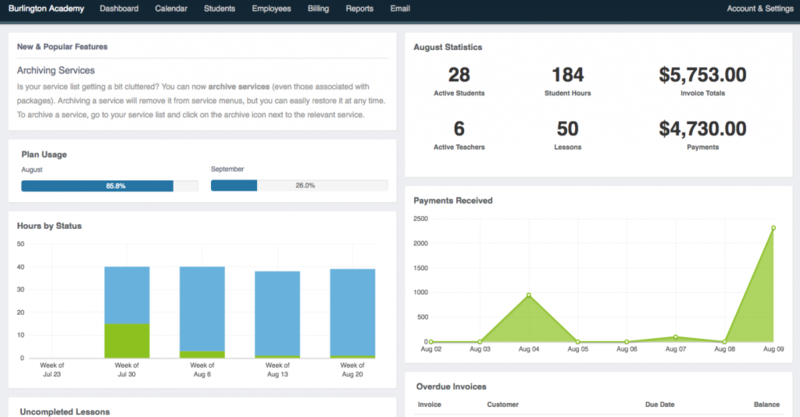 You can easily view hours by status, student and teacher counts, invoice and cash totals, overdue invoices and more. You can choose the stats that are most important to your business and display these on your dashboard by customizing it. The lesson summaries report is a versatile report that allows you to find information related to lessons. The report offers various filtering options, allowing you to get the information you need, quickly and efficiently. Once you’ve made your selection, you can save your search to easily run a similar report in future. Report Type: You can choose between “Lessons by Student” to view results related to the students in a lesson or “Lessons” to view top level information about a lesson. Filters: These are all the different filters that you can apply to a report (such as the status of lessons or the location). Grouping: You can choose how results are grouped, if grouping is not important for your required report, you can just leave this blank and results will appear in chronological order. Order – Choose whether results should appear in ascending or descending order. Columns – You can include a number of different columns in your report, including: Day, End Date, Start Time, End Time, Teacher, Teacher Email, Service, Location, Cost, Discount, Status, Duration, Customer, Customer Email, Student, Student Email, Description, Shared Notes, Private Notes. You can also include your logo on the report when you save it as a PDF. The breakdowns report gives you a breakdown of a specific measure (such as lesson revenue or payments received) by category (such as service) for a particular date range. Once you’ve selected a start date, end date, measure, and a category, a table will display with a list of the results, their values and the percentage of the total. A pie chart with colour-coded results is also rendered, making it easily to find the information you need at a glance. Measures Include: Lesson Revenue, Payments Received, Lesson Wages, Lesson Hours, Student Lesson Hours, Lesson Count, Student Lesson Count, Package Units, Package Revenue, Charge Revenue. The time series report allows you to view the daily total value of a measure (such as Gross Margin or Invoice Totals) for a selected period of time. A line chart is displayed at the top of the report and a table is included at the bottom with the totals for each day displayed in list form. Measures: Gross Margin, Invoice Totals, Invoice Totals (Due Date), Invoice Totals (Less Credits), Credit Note Totals, Payments Received, Teacher Payments, Lesson Revenue, Lesson Wages, Package Revenue, Lesson Count, Charge Revenue, Lesson Count By Student, Lesson Hours, Lesson Hours By Student. We’ve recently added a new report called the “Last Lesson Report”. A “days passed” column is included to make it very easy to spot inactivity up to a selected date. Based on your findings, you can follow up with your clients to schedule more lessons, or you can deactivate their profile altogether. 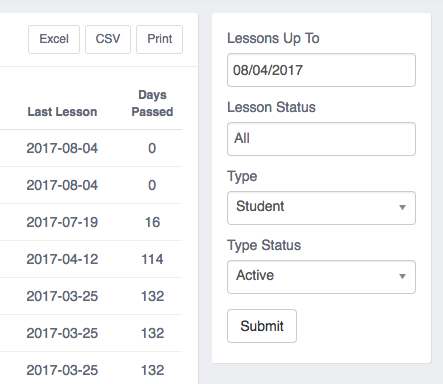 The report allows you to filter by student, teacher or family and you can also choose the status of the lessons. Analyzing data on a regular basis will help you to identify trends and potential problems. By looking at your company’s gross margin over time for example, you can spot negative trends or days where the value is abnormally low. You can take a closer look at the underlying data and then come up with a plan of action to address the problem.